I teach four classes of sixth graders and right now, two of those classes are finishing up the novel Flush by Carl Hiassen. This engaging and often-funny book centers on pollution of waters off the Florida Keys by a gambling boat and the efforts of a boy and his family to stop the pollution and protect the beach where endangered Loggerhead Turtles come to lay eggs. We’re on a year-long inquiry around the environment, thanks in part to our participation in the Voices on the Gulf Project, and I saw an opportunity here with this book to try to do something constructive. So, we agreed that we would “adopt” a loggerhead turtle that is being cared for by the Loggerhead Marinelife Center in Jones Beach, Floriday. The catch was that my students could not just go home and ask for $2 for the turtle project. They had to earn it, and the suggestion that they came up with was raking leaves (we’re in New England and leaves are everywhere right now). The packets of information for our turtles (each class adopted one) came in yesterday and the kids were very excited. 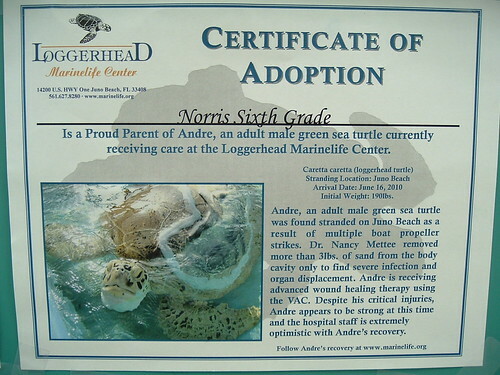 Sure, there were some jokes about “why didn’t they ship the turtle?” But overall, I could tell they were satisfied that they had some something good for the environment with this simple turtle adoption project, and it connected perfectly with our reading of the novel and our research around turtles. Now, I’m thinking: they might need to invent a story with our adopted turtles — Andre and Gilda — as characters. Hmmm.